Want to get more traffic to your blogs? Here are 15 ways to start getting more eyeballs on your blogs – both brand new visitors and repeat visitors. 1. 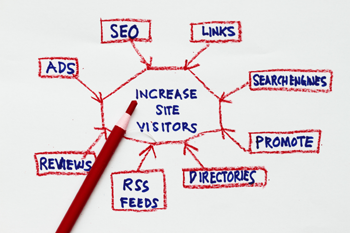 Change your blog linking structure. By default, most blogs don’t have SEO-friendly URL structures. Change it so your keywords are in there by default. 2. Create a posting schedule. It’s more important that you post consistently than quickly. If you can have at least 1-2 posts scheduled at any given time, you’re in good shape. How does this help get more people to your blog? If people see that you regularly update your blog, they are much more likely to return to see what you have coming next. 3. Don’t be afraid to be controversial. Controversy gets people talking, and more importantly, gets people sharing your site. Especially if they disagree with you. 4. Create quizzes that are related to your market – people love taking short quizzes to see how they stack up against their friends. Include a feature that lets them automatically post their results to their Facebook page for the friends to see, and you’ll likely start a good flow of viral traffic. 5. Create an info graphic related to your market. An info graphic is just a graphic with a ton of information on it, arranged in a creative way. People love sharing these on Social Networks, and people will find their way to your site. You can get a pretty good infographic created on Fiverr.com, or you can find someone on oDesk.com to put one together for you. 6. Connect your blog to your Facebook Fan Page and Twitter account. Whenever you post something to your blog, it should automatically post to your Facebook page and Twitter feed. If it’s good content, your followers will happily share your post or retweet your link. 7. Create YouTube videos. Embed your video on your blog, and be sure title of the video has your main keywords in it. Adding video to your blog helps get people to stay on your site longer, and come back more often. Google also loves sites that have video on it, so having your keywords in your video title will help you rise in the Google rankings. 8. Check Google Trends to find out what the most popular searches are. Base your posts around these topics to draw more people to your blog. 9. Social Bookmarking. Bookmarking your sites on the popular Social Networks is a great way to increase your popularity in the eyes of Google, and make sure people see your posts. You can find someone to bookmark your site on dozens of social sites on Fiverr.com, so do this for each of your posts. 10. Respond to people who comment on your posts. People love having that interaction with the author of good posts, so responding to your commenters is a great way to build a loyal fan base. This will also make sure people keep coming back to your blog to see if you have replied to their comment. 11. Create a Google Alert for your blog – this will show you who is talking about it on another site, or linking to you. You can use this to find joint venture partners, or guest bloggers . . .
12. Speaking of guest bloggers, this is another great way to get more people to your blog. You can create an original, informative blog post to be posted on another blog – you’ll get a link back to your blog, plus be able to reach the loyal readers of that other blog. If you allow guest bloggers to post on your blog, you can also reach their loyal readers this way (good chance they’ll tell their readers where they can find the latest article they wrote), plus you get free content for your blog. 13. Include images in your blog posts, and use your main keyword for that post as the Title of the image, and also as the Alt-Tag for the image. I have received a lot of traffic from Google Images from doing this, so be sure to include a well-optimized image in each blog post. 14. Create ads on Facebook – this can get you a lot of traffic for relatively little cost. Facebook ads are usually much cheaper, and more targeted, than PPC from Google. 15. Have a small contest. Give the winner a $20 gift card to Amazon or another store related to your market. The contest could simply be a random drawing of everyone who comments on one of your posts. It doesn’t have to be complicated.